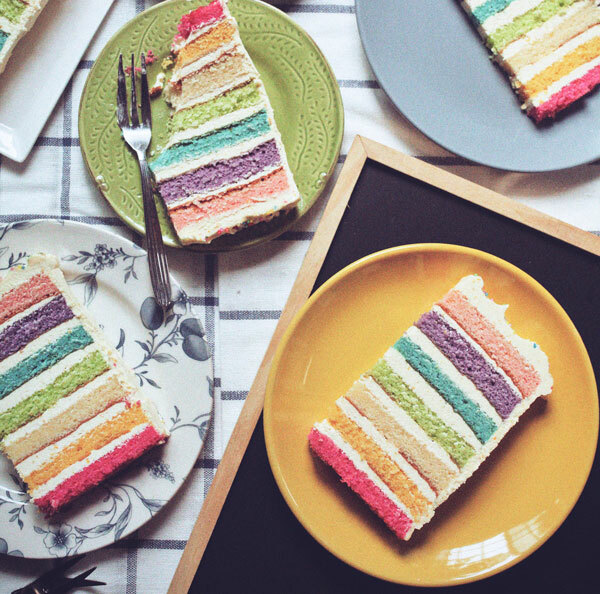 Ribbon And Circus: My first Rainbow Cake and etc. My first Rainbow Cake and etc. The recipe is based on the original Hummingbird Bakery's Vanilla cupcake, where the recipe said that it would yield 12 cupcakes, but in my case it gave me enough batter to make 2 layers (8x8 pan) of the rainbow cake-Yerp, I made a squarish rainbow cake. I had to re-double the recipe to get the cake done. I believed this is the best vanilla cake I've ever made, so far. The intensity of the vanilla is unbelievably amazing, texture-wise-moist and fluffy. Everything is perfect but I think the frosting could use a little less sugar and orange zest than the recipe calls for. The zesty taste is covering the whole vanilla taste, what's the point kan? okay, I better get back to my boxes..they are screaming for me..argh. PS: . We're going to be so busy next couple of month, with renovation works, blah2..so I think this would probably be my last post for this year. 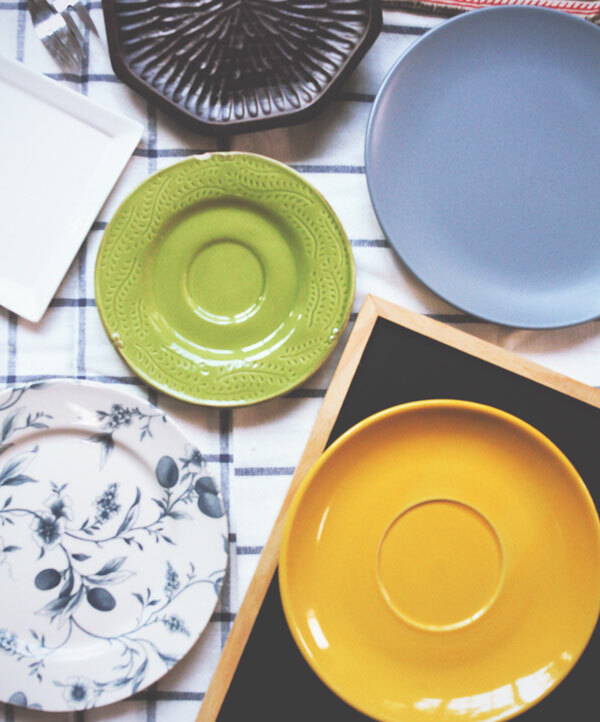 La Kitchen will be continued as usual on January. Apologize for that. No internet connection, while mobile blogging is so not me. Tak best. 19/6/2014: I have update the original recipe by doubling it. 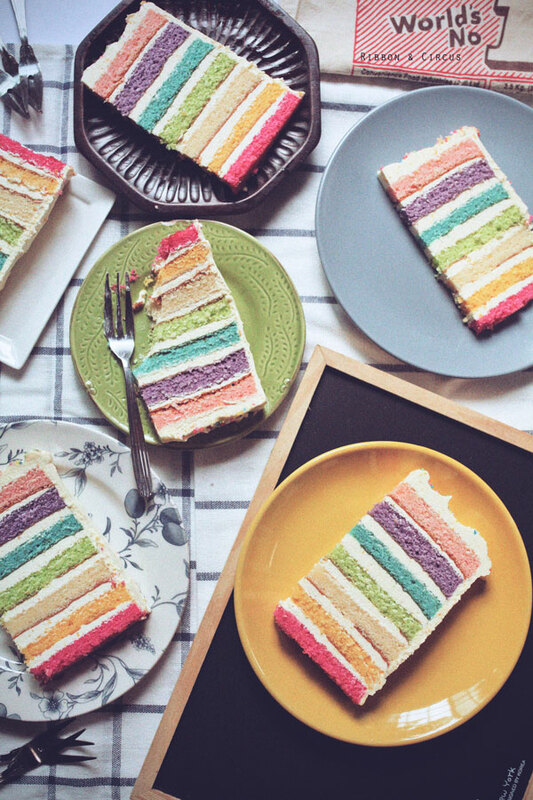 You don't have to double it coz below recipe is enough to make a 7" rainbow cake. This is the easiest cake ever! Put the flour, sugar, baking powder, salt and butter in a mixing bowl and beat on slow speed until everything is combined and you have a crumb mixture with a sandy consistency. Gradually pour in half the milk and beat just until the milk is incorporated. Divide batter into 5 cups, or 7 (I've done it before), and put your desired food colouring in each bowl. Divide batter amongst 5 7"x7" baking pans and bake at 325F (163 C) for about 15 to 20 minutes or until a skewer inserted in the centre comes out mostly clean. Cool before frosting. Beat butter and sugar until it doubles its size and creamy. Cut the cheese into small cubes and add them one by one the butter mixture while beating them in medium speed. aku mmg nak cuba recipe ni, tapi bab colour tu yg aku malas nak pi beli tu, haishhh! Wow!!!! Terlalu perfect! ... Love ur space ...Kemas... .. Happy to follow u! Glad if u do the same! hah! bunga telang, mcmana rupa bunga telang aku pun taktau.. hahaha.. nanti aku dah settle down kat Malaysia, aku akan kumpul la colour2 ni, ko pakai brand apa eh colouring paste ni semua? Mim, sorry lambat reply..aku bizi packing barang..ko packing barang lom? aku pakai campur2..ada wilton, ada redman.paling byk tu jenama local rose brand tu.. hihi .mana yg ada cap halal or list of ingredient dia halal aku beli.. coloring paste ni byk yg x halal.. aku kekadang ragu2 nak beli brand famous amos sbb takut tak halal..
Yerp, had to agree with you..the colorings scared me much. My first intention was to make a pastel colored rainbow cake, so I could only use one or two drops of artificial coloring. Unfortunately, it didn;t happened as I expected. The color was so dull, instead of pastel looking. I suggest you use coloring paste so you don't have to use much to make the rainbows pop. Hi there! been ages since I visited blogworld! 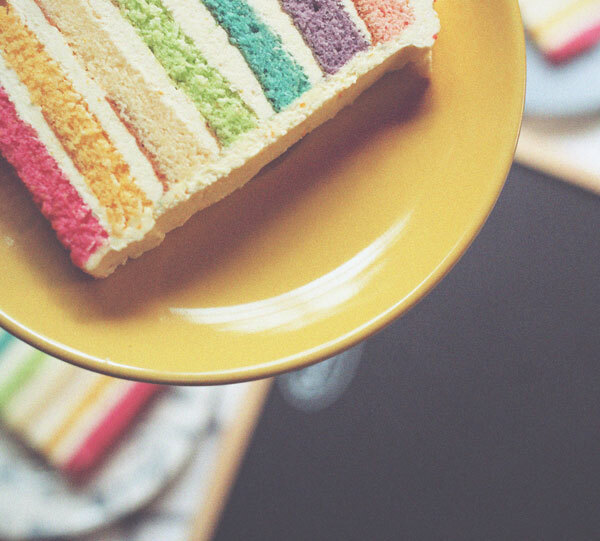 Your rainbow cake looked smashing as usual! Last 2 weeks I did one too, but the malas way, only 3 layer and used makcik Betty cake mix. Hehehe, boleh la nak makan.. I'm confused at to how you colored each layer differently. I see no instructions for doing this in the cake recipe above. It look tasty. 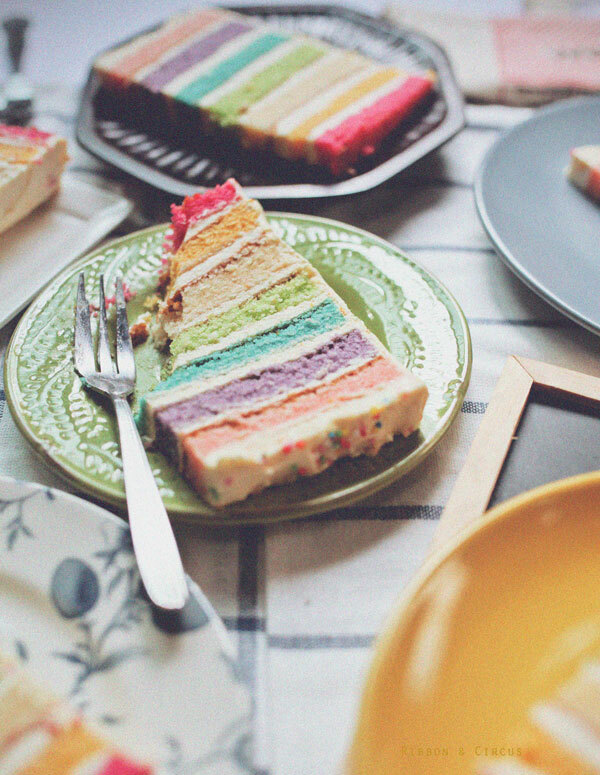 Is there a flavour for each coulour of the rainbow cake or not? You can always add flavor to each layer. I would skip the vanilla extract if I do this. I tried to make this cake for my daughters birthday party. Despite the recipe stating it was enough for all 5 layers (even 7) without doubling, the layers were way too thin. Like pancakes. I had to throw it all out and start from scratch with a new recipe. I was able to get 3 layers out of one recipe. I did this twice for a 6 layer cake and it came out nicely. I used 1.5 cups of batter in my 10" round pans. You have to make sure to only use 1.25 cups sugar or else it's too much and super gooey.